Meet Jean-Pierre. 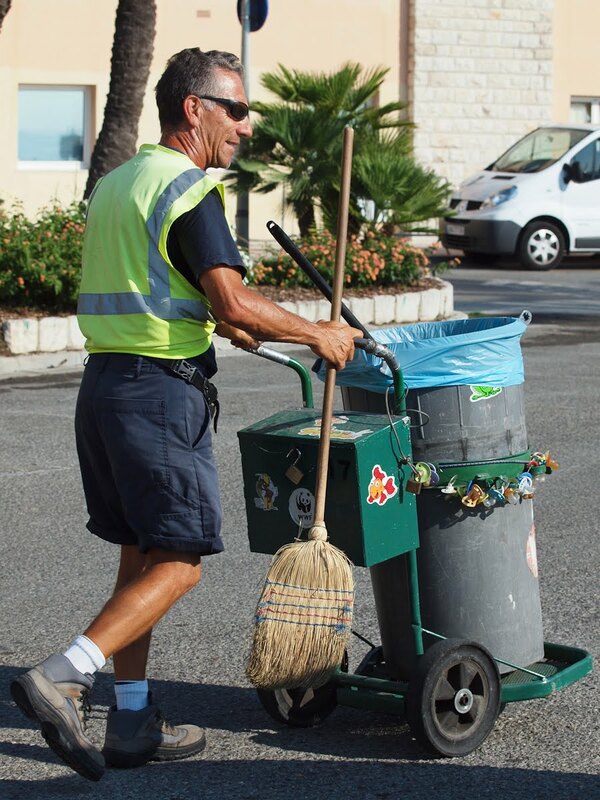 He's one of many who keep Menton's streets and beaches clean. Take a look at his bin... he has been collecting babies' dummies (pacifiers) for ten years and displays them on a piece of wire. 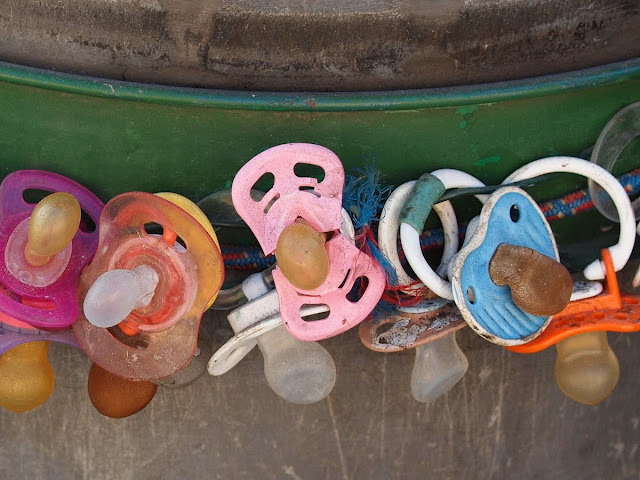 We all know how babies throw their dummies away - now we know where to find them. 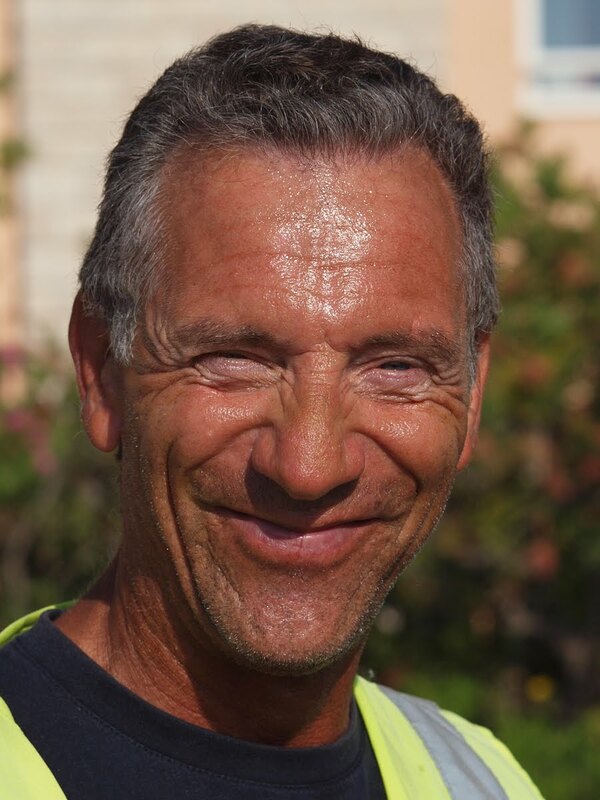 Voici Jean-Pierre. Il fait parti du nombreux personnel chargé du maintient de la propreté des rues et des plages de Menton. Jetez un oeil à sa poubelle...il a collecté des sucettes de bébés pendant dix ans et maintenant, il les a réunies en guirlande sur un cordon. Nous savons tous comment les bébés jettent leurs sucettes au loin - maintenant nous savons où les trouver. now i wonder if there is someone who collects all the missing socks. what a wonderful post, jilly. WV: sinsiti = Here it's Las Vegas. Fabulous slice of life post, Jilly! I like the way you notice details; And what it says about that man; And the way you are interested by discret people. Again, one of your wonderful portraits, with a story! We call them binkies or passies. Now, that is certainly original! A little creepy, maybe, but unique. I could use one right about now. Well I"ve had a few of my grandkids that would love to meet this man and borrow some of his 'su-su's" What a delightful thing for him to collect and show. I love his smile too. Jilly, you do the best portraits of any of us. Great portrait Jilly ! All three photos complement each other beautifully and make up a great story. Africa in Gorbio - Energy!